Update: I realize these photos need a little explaining. All three dogs have the same characteristic ears, right folded, left flat. The top two photos are of “Richard’s” dog “Governor” posted on the WASP 101 blog. This first dog has an official diamond tag with markings corresponding to the official Stokes County dog tag picture below it. The markings are clearer in the original photo from which it was cropped. Stokes County dogs are required to be registered and wear such a tag which has different colors for different years. The second dog is carrying a pink Victoria’s Secret bra. The third dog, Holloway’s “Governor”, on the bottom right is cropped from the Holloway family “stoop” photograph shown elsewhere. 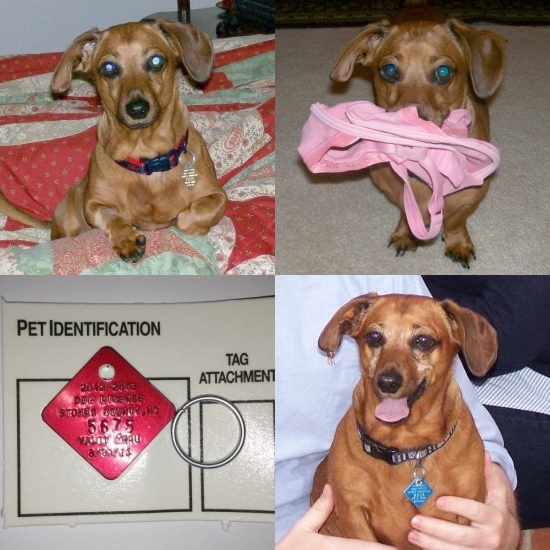 The dog is wearing a blue diamong tag with characteristics of the official Stokes County dog tag. This entry was posted in Uncategorized and tagged Bryan Holloway, Governor, NCGA, Stokes County, WASP101. Bookmark the permalink.